Obedience is the foundation to all aspects of your relationship with your dog. In order to build a foundation you must first start with the correct knowledge and tools. 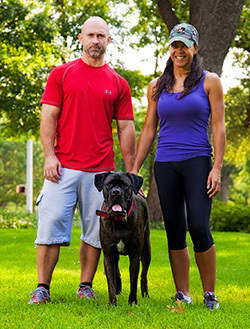 MTK9 teaches you, the owner, about your dog’s natural instincts and behaviors. Exercises are designed to obtain optimal results that are easy to understand and apply. This is an introductory course. Through using high value reward techniques your dog will become familiar with hand signals and six commands. Includes Basic Obedience with heavy distractions and additional commands preparing for off-leash work. Achieving all the above off-lead which can transcend into competitions. In order to achieve the greatest results behavior problems must be addressed in conjunction with proper obedience. 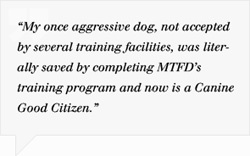 MTK9’s specialties include; handling and training large breed and aggressive dogs. 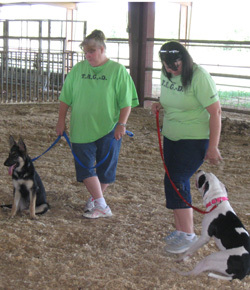 We excel at challenges, our passion is educating handlers and training dogs not just certain breeds and/or sizes! Certified Decoy Instructor, Rob of MTK9 has trained a numerous amount of people both men and woman of various ages to safely get bit! His record speaks for itself. Working with hundreds of dogs in various fields for over twenty five years he has never been bitten unless he was supposed to be! In addition to successfully training several decoy apprentices without any serious injuries he has created certifications for decoys, associations and protection sports. MTK9’s Decoy Certification is complete from learning about proper equipment to reading a dog’s actions. A five level process.